Are Melacare Cream Good for US? How to Apply Melacare Cream? What Are the Side Effects of Melacare Cream? Middle summer is the perfect time to go to the beach, but you will get a considerable tan. You then use Melacare to whiten your skin a bit, and after a while stopped. At this point, you noticed that your skin became more irritated after stopping. Why would this happen? Are there any Melacare side effects? And how should Melacare cream be used properly? Melacare cream is designed for the purpose of healing itchiness, redness, and swelling, stemming from dermatitis, eczema or other various skin conditions. 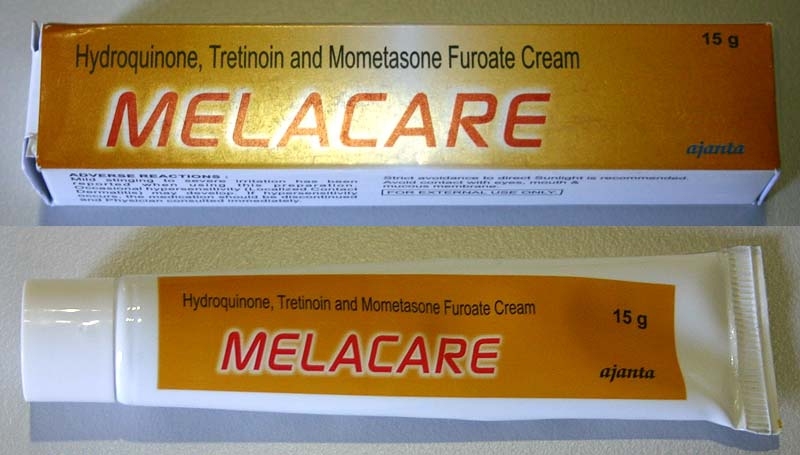 At first, Melacare was made primarily to cure melasma, another skin discoloring condition. This cream has three active ingredients, including hydroquinone, tretinoin, and mometasone. Hydroquinone is the active agent responsible for bleaching and skin whitening; its sole purpose is to slow the process of skin discoloration and avoid dark spots in the tan. Tretinoin is used to treat acne and reduce the effect of wrinkles, especially those caused from UV exposure. Lastly, mometasone is the ingredient that focuses on reducing swelling and inflammation on the skin. Melacare cream typically is rubbed onto the skin by hand but use it no more than once per day. When applying, the first layer should be very thin and rubbed in very softly. Melacare cream is typically applied to the skin on the face. It is recommended to apply the cream at least 30 minutes prior to going to bed. First you should use a mild soap or cleanser to wash your face, dry it and then apply a pea-sized drop of Melacare and make it into a thin layer. Then, allow it to soak during the night, and wash off the chemicals in the morning. Additionally, Melacare has the best results if you have a judicious diet of fruits, vegetables and imbibe plenty of water. This not only makes for a healthier skin, but also helps Melacare process and work as intended. It is recommended avoiding the usage of Melacare cream on dry, itchy or sunburnt skin, as well as avoiding getting the cream in the eyes and nose. Avoid exposure to the sun. Hydroquinone has a negative reaction to the UV rays of the sun that can result in a darkening of the skin through photo-allergic reactions. So if you are planning on taking a stroll outdoors, apply sunscreen on top of Melacare. The manufactures recommend applying SPF 15 or higher every 2 hours religiously. There are several Melacare side effects, including blisters in hair skin cells as well as the thinning, irritation, increased redness, and itching of the skin. Long-term exposure can result in cutaneous ochronosis, from the hydroquinone. This is a permanent discoloration in the joint cells. As a precaution, talk to your doctor if you are pregnant or breastfeeding, if you have any allergies or other health conditions, or if you are using any additional medicine or supplements. Also discuss whether Melacare cream and its active ingredients could be a right fit for you. When using, make sure to follow the instructions given by your doctor or pharmacist. Additionally, if any allergic reaction occurs, stop using and medical attention immediately. These symptoms include hives, skin rashes, swelling, pain in the chest, and trouble breathing or swallowing. Server responsed at: 04/25/2019 2:13 a.m.